Eeesh, I'd love to see him move. Bet it'd give people the heeby jeebies. Manky also looks plenty fierce. He always scared the daylights out of me as a kid, but I love that gangly abomination. I'd freak if I saw that thing coming at me full speed in a level. 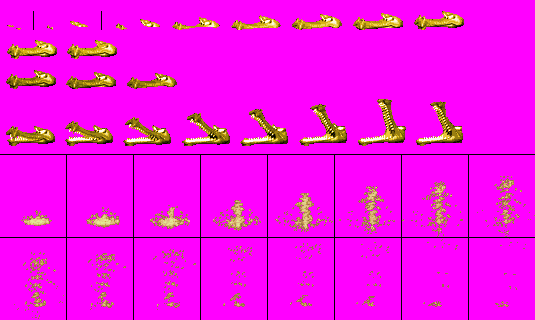 Here are the sprites of my new DK animation for the Bleak boss battle and the Sideshow. 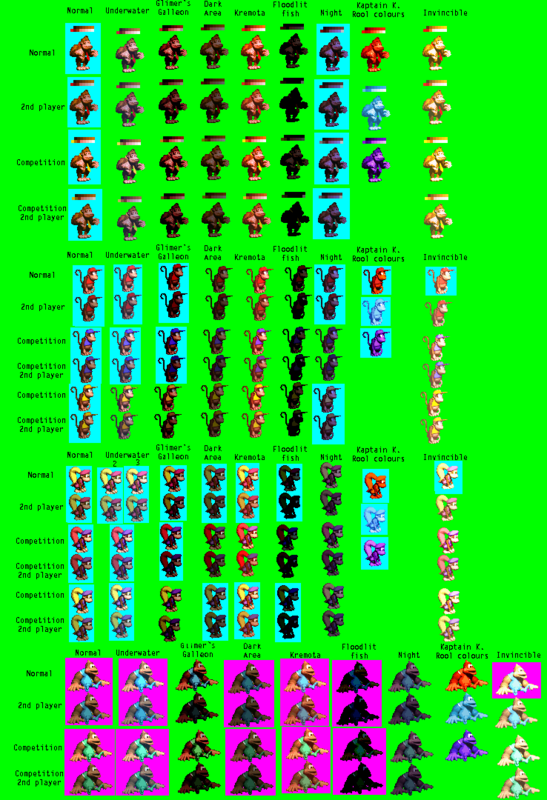 Diddy's sprite sheet for his new Bleak/Sideshow animations. ...if a Tiki and a Waldought could be converted into SNESed 16-bits. Didn't really know where to put this so I set it in here, and will probably move it into the DKC4 topic. So does anyone remember the Crash Bandicoot games for the GBA? They used the same kind of deal with DKC-3D rendered art on a 2D system. And it is from one of these games that I have an idea for a fan character that could go pretty well in DKC4. Pictured here is the sprite sheet for N-Trance, from the game Crash Bandicoot 2: N-Tranced. I feel that somehow, this and other things from the GBA crash games would make perfect DKC related game material, including levels and such. For example, I myself tried making a DKC equivalent to N-Trance above, and, well, see for yourself. Here are some new bonus images. I decided to edit the GBA DKC bonus images to include all of the Kongs. Welcome back Phyreburnz! Also good work! Do you think you could provide a rendition of all of those with just DK, Diddy, and Dixie for DKCX? Even if VideoViking doesn't plan on using them, I might be able to do something with them anyway. Some of them are hard to get balanced since there are an odd number to use. Hopefully this works well, though. I decided to redo the colour palettes that I had done before. All of the ones with a green background are new. The blue and pink backgrounds are original, untouched sprites. custom Revolver sprite sheet in the DKC style, i edited some of aperson98's Klump grenade throwing sprites on my pc, so he could shoot this gun, but i didn't upload that because it was an edit of aperson98's sprites, so i just uploaded this gun instead, i think its pretty good, especially compared to my average stuff, Enjoy. Welcome to the forums, Oddworld-2001! That looks pretty nice in my opinion. Phyreburnz, I was wondering, whilst I don't intend for him being a character(though it could work out since he worked out well in Tropical Freeze), could you try making those palettes fit onto Cranky Kong's sprite? I thought that would be an interesting idea. You can also try the purple/red/blue/yellow competitive palettes on all of the kongs, if you would like. For some reason I'm making Jungle Japes. The catch? I can only use assets found in the DKC games. This is it so far. I'm not sure what to use for the door on the outhouse yet. Final version of Melee's Jungle Japes. No door equivalent exists in any of the DKC games, so the outhouse looks a bit bare. Hey, Ton, maybe you could fashion a door by using the archway from Kastle Kaos? Not sure right now what you could use for inside of the frame, but maybe you could just cut out some of the wood from the mill levels? Hey Phyre! I actually tried that, but couldn't get it to look right. If you want to give it a go, please do! You have way more experience in DKC editing. Eh... I personally don't like it that much. The door does not transition well into the barrel, maybe it should have more curvature? Phyreburnz wrote: Here are the sprites of my new DK animation for the Bleak boss battle and the Sideshow. I dig the idea of fitting kongs into games they weren't in, this and diddy's are great! OneOf99 wrote: Eh... I personally don't like it that much. The door does not transition well into the barrel, maybe it should have more curvature? Yeah, it doesn't quite work. Ah well. Thanks for trying anyway! Maybe we can figure something out later. Has anyone came up with this desert gimmick? Krocksand is a type of Krockhead that is made of pure sand, its gimmick is rise from quicksand, then moves back and forth before disappearing down the quicksand, then rises again and the pattern repeats, so you have to think before, one fake step and the Kongs would get swallowed by the quicksand. is a chinese themed Kremling, he would hurt you always with his spear, so to defeat him, you must make him locate you so he throwns his spear, this would make him defenseless, with a jump or a roll you would beat him. There could be a palette swap version where he would spin his spear to blow you like a wind, it could be dangerous since there could be a pit or any other hazard near. is a native american tribe Kutlass variant, but attacks horizontally, the only way to defeat him is making his tomahawks get stuck in the walls to jump at him. is not a Kremling, he fits in the regular baddies category, you first encounter them as a small weenie wolf, but when you jump at him prepare to embrace panic! He will turn into a bulky werewolf and start chasing you until you're knocked out! Original rips from The Spriters Resource, small edit by me, I was originally going to make the eyes blue gem colored on the Krocksand, but I discarded it. I like these ideas a lot. What did you do to make these sprites? I'm wondering about the possibility of making multiple frames and having them animated. The only one that I think would need some work is the native American one. I had a hard time understanding what it was supposed to be until I read the description. I would like to suggest trying to make it more minimal. I feel like there's too much going on to make it easily recognizable right away. Phyreburnz wrote: I like these ideas a lot. What did you do to make these sprites? I'm wondering about the possibility of making multiple frames and having them animated. is a vampire Kremling that attacks you by shooting bats named , then he transforms into one flying around, to kill him you just jump above him twice, as at the first time he turns into a Fangs. Or to kill him directly, you throw a barrel, if you try to roll at him, you get bitten. is a huge hybrid Kremling that you can't defeat him easily with a simple jump, and attacks summoning a lightning like a rod thanks to his Tesla coil behind him, so you must throw any object at him to stun him, then jump at him. is just a Kritter covered in wrappings that come from egyptian sarcophaguses, you must destroy the sarcophagus near to defeat him, or else you will get bored trying to stomp or roll him manytimes without any outcome. is a Kobbles that developed water gills and swims around, his pattern is similar to the Lab Assistants found in the Prehistoric Swamps from Crash 3, you can't attack them by rolling. Just jump at him to defeat him. You even supplied the sprites! Well done, and thank you for your generosity. New sprites for DK catching a hook, idling on a hook, and idling on a horizontal rope.